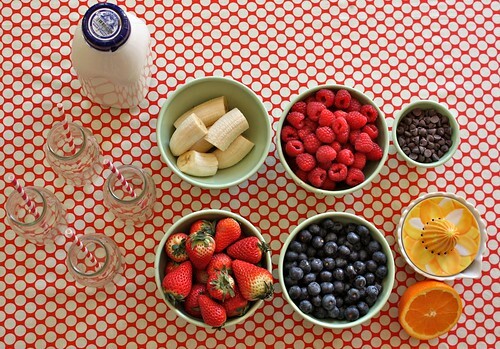 smoothie bar | Hip Hip Hooray! A smoothie bar is a perfect addition to your spring and summer parties. Fill bowls with several ingredients, have a blender handy and let your guests concoct their original flavors. What would your blend be? LOVE this idea!! My favorite combination is strawberries, kiwi, grapes, blackberries & banana…delicious!! I love the health aspect to this … not just all about cake, cupcakes, cookies … I LOVE the colors. Very very cute! What a lovely idea! Mine would be: bananas + strawberries + milk + honey! Perfect for a spring brunch party, yum! 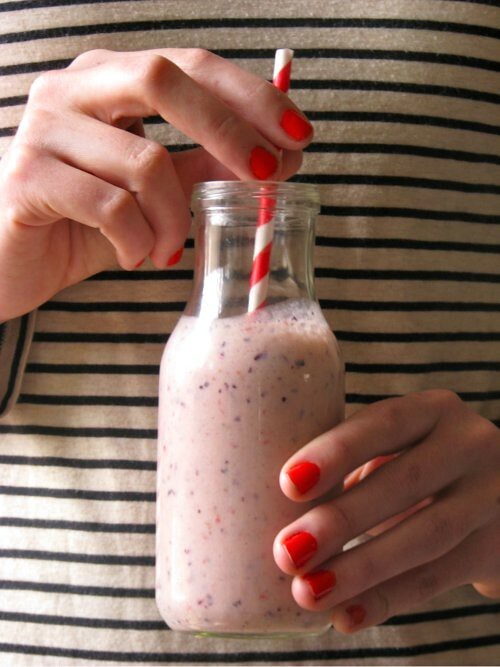 Where did you find the adorable glass “milk” jars? They’re actually empty frappuccino bottles. What a clever idea, perfect for summer parties! thanks for sharing!